The tropical rain forest is a forest of tall trees in a region of year-round warmth. An average of 50 to 260 inches (125 to 660 cm.) of rain falls yearly. Rain forests belong to the tropical wet climate group. The temperature in a rain forest rarely gets higher than 93 °F (34 °C) or drops below 68 °F (20 °C); average humidity is between 77 and 88%; rainfall is often more than 100 inches a year. There is usually a brief season of less rain. In monsoonal areas, there is a real dry season. Almost all rain forests lie near the equator. Rainforests now cover less than 6% of Earth's land surface. Scientists estimate that more than half of all the world's plant and animal species live in tropical rain forests. Tropical rainforests produce 40% of Earth's oxygen. A tropical rain forest has more kinds of trees than any other area in the world. Scientists have counted about 100 to 300 species in one 2 1/2-acre (1-hectare) area in South America. Seventy percent of the plants in the rainforest are trees. About 1/4 of all the medicines we use come from rainforest plants. Curare comes from a tropical vine, and is used as an anesthetic and to relax muscles during surgery. Quinine, from the cinchona tree, is used to treat malaria. A person with lymphocytic leukemia has a 99% chance that the disease will go into remission because of the rosy periwinkle. More than 1,400 varieties of tropical plants are thought to be potential cures for cancer. All tropical rain forests resemble one another in some ways. Many of the trees have straight trunks that don't branch out for 100 feet or more. There is no sense in growing branches below the canopy where there is little light. The majority of the trees have smooth, thin bark because there is no need to protect the them from water loss and freezing temperatures. It also makes it difficult for epiphytes and plant parasites to get a hold on the trunks. The bark of different species is so similar that it is difficult to identify a tree by its bark. Many trees can only be identified by their flowers. Despite these differences, each of the three largest rainforests--the American, the African, and the Asian--has a different group of animal and plant species. Each rain forest has many species of monkeys, all of which differ from the species of the other two rain forests. In addition, different areas of the same rain forest may have different species. Many kinds of trees that grow in the mountains of the Amazon rain forest do not grow in the lowlands of that same forest. There are four very distinct layers of trees in a tropical rain forest. These layers have been identified as the emergent, upper canopy, understory, and forest floor. Emergent trees are spaced wide apart, and are 100 to 240 feet tall with umbrella-shaped canopies that grow above the forest. Because emergent trees are exposed to drying winds, they tend to have small, pointed leaves. Some species lose their leaves during the brief dry season in monsoon rainforests. These giant trees have straight, smooth trunks with few branches. Their root system is very shallow, and to support their size they grow buttresses that can spread out to a distance of 30 feet. The upper canopy of 60 to 130 foot trees allows light to be easily available at the top of this layer, but greatly reduced any light below it. Most of the rainforest's animals live in the upper canopy. There is so much food available at this level that some animals never go down to the forest floor. The leaves have "drip spouts" that allows rain to run off. This keeps them dry and prevents mold and mildew from forming in the humid environment. The understory, or lower canopy, consists of 60 foot trees. This layer is made up of the trunks of canopy trees, shrubs, plants and small trees. There is little air movement. As a result the humidity is constantly high. This level is in constant shade. The forest floor is usually completely shaded, except where a canopy tree has fallen and created an opening. Most areas of the forest floor receive so little light that few bushes or herbs can grow there. As a result, a person can easily walk through most parts of a tropical rain forest. Less than 1 % of the light that strikes the top of the forest penetrates to the forest floor. The top soil is very thin and of poor quality. A lot of litter falls to the ground where it is quickly broken down by decomposers like termites, earthworms and fungi. The heat and humidity further help to break down the litter. This organic matter is then just as quickly absorbed by the trees' shallow roots. Besides these four layers, a shrub/sapling layer receives about 3 % of the light that filters in through the canopies. These stunted trees are capable of a sudden growth surge when a gap in the canopy opens above them. The air beneath the lower canopy is almost always humid. The trees themselves give off water through the pores (stomata) of their leaves. This process, called transpiration, can account for as much as half of the precipitation in the rain forest. Rainforest plants have made many adaptations to their environment. With over 80 inches of rain per year, plants have made adaptations that helps them shed water off their leaves quickly so the branches don't get weighed down and break. Many plants have drip tips and grooved leaves, and some leaves have oily coatings to shed water. To absorb as much sunlight as possible on the dark understory, leaves are very large. Some trees have leaf stalks that turn with the movement of the sun so they always absorb the maximum amount of light. Leaves in the upper canopy are dark green, small and leathery to reduce water loss in the strong sunlight. Some trees will grow large leaves at the lower canopy level and small leaves in the upper canopy. Other plants grow in the upper canopy on larger trees to get sunlight. These are the epiphytes such as orchids and bromeliads. Many trees have buttress and stilt roots for extra support in the shallow, wet soil of the rainforests. Over 2,500 species of vines grow in the rainforest. Lianas start off as small shrubs that grow on the forest floor. To reach the sunlight in the upper canopy it sends out tendrils to grab sapling trees. The liana and the tree grow towards the canopy together. The vines grow from one tree to another and make up 40% of the canopy leaves. The rattan vine has spikes on the underside of its leaves that point backwards to grab onto sapling trees. Other "strangler" vines will use trees as support and grow thicker and thicker as they reach the canopy, strangling its host tree. They look like trees whose centers have been hollowed out. Dominant species do not exist in tropical rainforests. Lowland dipterocarp forest can consist of many different species of Dipterocarpaceae, but not all of the same species. Trees of the same species are very seldom found growing close together. This bio diversity and separation of the species prevents mass contamination and die-off from disease or insect infestation. Bio diversity also insures that there will be enough pollinators to take care of each species' needs. Animals depend on the staggered blooming and fruiting of rainforest plants to supply them with a year-round source of food. Many species of animal life can be found in the rain forest. Common characteristics found among mammals and birds (and reptiles and amphibians, too) include adaptations to a life in the trees, such as the prehensile tails of New World monkeys. Other characteristics are bright colors and sharp patterns, loud vocalizations, and diets heavy on fruits. Insects make up the largest single group of animals that live in tropical forests. They include brightly colored butterflies, mosquitoes, camouflaged stick insects, and huge colonies of ants. The Amazon river basin rainforest contains a wider variety of plant and animal life than any other biome in the world. The second largest population of plant and animal life can be found in scattered locations and islands of Southeast Asia. The lowest variety can be found in Africa. There may be 40 to 100 different species in 2.5 acres ( 1 hectare) of a tropical rain forest. When early explorers first discovered the rainforests of Africa, Southeast Asia and South America, they They were amazed by the dense growth, trees with giant buttresses, vines and epiphytes . The tropical vegetation grew so dense that it was difficult to cut one's way through it. It was thought at the time that the soil of a rainforest must be very fertile, filled with nutrients, enabling it to support the immense trees and other vegetation they found. Today we know that the soil of the tropical rainforests is shallow, very poor in nutrients and almost without soluble minerals. Thousands of years of heavy rains have washed away the nutrients in the soil obtained from weathered rocks. The rainforest has a very short nutrient cycle. Nutrients generally stay in an ecosystem by being recycled and in a rainforest are mainly found in the living plants and the layers of decomposing leaf litter. Various species of decomposers like insects, bacteria, and fungi make quick work of turning dead plant and animal matter into nutrients. Plants take up these nutrients the moment they are released. A study in the Amazon rainforest found that 99% of nutrients are held in root mats. When a rainforest is burned or cut down the nutrients are removed from the ecosystem. The soil can only be used for a very short time before it becomes completely depleted of all nutrients. The tropical rain forest can be found in three major geographical areas around the world. Central America in the Amazon river basin. Africa - Zaire basin, with a small area in West Africa; also eastern Madagascar. Indo-Malaysia - west coast of India, Assam, Southeast Asia, New Guinea and Queensland, Australia. 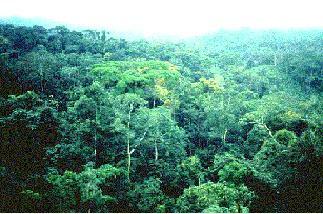 In an average year the climate in a tropical rain forest is very humid because of all the rainfall. A tropical rainforest gets about 150 cm of rain per year. It gets lots of rain because it is very hot and wet in rain forests. The hotter the air, the more water vapor it can hold. It rains usually about 1/8 of an inch per day. This climate is found near the equator. That means that there is more direct sunlight hitting the land and sea there than anywhere else. The sun warms the land and sea and the water evaporates into the air. The warm air can hold a lot of water vapor. As the air rises, it cools. That means it can hold less water vapor. Then as warm meets cold, condensation takes place and the vapor forms droplets and clouds form. The clouds then produce rain. It rains more than ninety days a year and the strong sun usually shines between the storms. The water cycle repeats often along the equator. The main plants in this biome are trees. This is important because in the rain forest, some rain never gets past the trees and to the smaller plants and ground below. Trees in this climate reach a height of more than 164 feet. They form a canopy. The forest floor is called understory. The canopy also keeps sunlight from reaching the plants in the understory. Between the canopy and understory is a lower canopy made up of smaller trees. These plants do receive some filtered sunlight. The tropical rain forest is classified under the Köppen Classification system as Af, meaning tropical forest. The A is given to tropical climates that are moist for all months and which have average temperatures above 18 degrees Celsius. The f stands for sufficient precipitation for all months. The latitude range for my climate is 15° to 25° North and South of the equator. The annual precipitation of a rain forest is greater than 150 cm. In a rain forest there is a short dry season. In only a month the rainforest receives 4 inches of rain. The rain forest climate is different from a lot of other climates. In other climates, the evaporation is carried away to fall as rain in far off areas, but in the rain forests, 50 percent of the precipitation comes from its own evaporation. A lot of the rain that falls on the rain forest never reaches the ground, instead it stays on the trees because the leaves act as a shield. The average temperature of a rain forest is about 77° Fahrenheit. The rain forest is about the same temperature year round. The temperature never drops below 64° Fahrenheit. Rain forests are so hot because they are found near the equator. The closer to the equator you are, the more solar radiation there is. The more solar radiation there is, the hotter it is. Rain forest are never found in climates which have temperatures 32° Fahrenheit and below because the plant life will not be able to live in the frost. All the plants will die out if the rain forest is cooler. The plants that make up the understory of a rain forest have adapted to the small amount of sunlight that they receive. Ferns and mosses do well, along with epiphytes. These are plants that grow on other plants. They can be found growing on branches of tall trees. There are many different plant species found in the rain forest. Stralhler, Arthur N. Strahler, Alan H. Elements of Physical Geography . John Wiley & Sons. 1997.